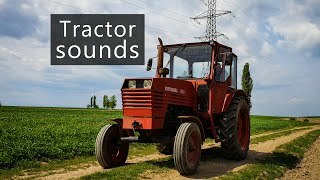 Comrade Tractor is a 5-channel recording of a Universal 650M tractor, designed in Soviet era Romania and virtually unchanged since the 1960s. Powered by a 4.8 liter Diesel engine, this beast hadn't been started since 2004. I got to drive it for an hour and all I can say is it doesn't go too fast but it growls like a tank. Categories: Trucks, Buses & Vans, Vehicles. I used a pair of DPA 4060 microphones to mic up the cabin and a pair of DPA 4061 on each side of the engine. The exhaust was a little tricky to mic up since it protruded from the bonnet, and it got extremely hot. After a few failed attempts I managed to tape a Sennheiser MKH8040 to the side of the cabin, pointing directly at the top of the exhaust. This way I managed to get that meaty growl of the exhaust without melting the microphone and cable. The 5 mics were plugged into the Sound Devices 633 and Mixpre 10T recorders. Each perspective sounds different and can be layered for creative vehicle sound design. Total recording time is just over 26 minutes, covering engine start, idling, driving slowly, driving fast, revving, accelerating, decelerating and a little reverse. As a bonus I included a short D100 engine cold start recording. The cabin DPAs sound nice and meaty with some reverb and plenty of creaks, rattles and bangs. The engine perspectives are growly on occasion but generally bright and whiny. The exhaust perspective is as growly and throaty as it gets. All perspectives are just brilliantly ripe for sound design, especially for crazy military or Mad Max -esque vehicles.